I’ve reviewed Noah and the Whale already, but I must say I’ve been looking forward to seeing an ex member, Laura Marling more, simply because of her stunning debut album ‘Alas I Cannot Swim‘, which showed maturity and songwriting prowess well beyond her 19 years. 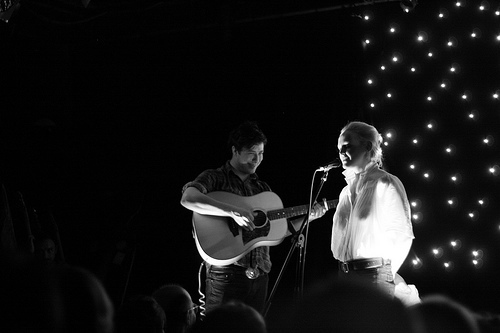 I went with a few friends who are fans, and my unsuspecting girlfriend, who was not yet aware of Laura Marling’s music. Hoxton Bar and Kitchen itself is a trendy place off Hoxton Square, which served quite a tasty selection of food and beer. The performance area itself was a smallish concrete room, which soon became totally packed out to 300 enthusiastic fans. Unfortunately, even with 2-3 sound engineers chipping in it soon became apparent we were in for a long night, with each act arriving on stage later and later. First was Sixtoes, a group of guys with an acoustic Anthony and the Johnsons kind of sound, who were quite pleasant to listen to. Then came the longeur of the night - Polly Scattergood. Its been along time since I’ve suffered through such a pretentious, contrived tripe (even at the level of an opener). From the laminated setlist, bad song lyrics, and a total lack of genuineness in performance. I read somewhere a review calling her ‘the new Tori Amos’. As an avid Tori fan, all I can say is no… just… No. Laura finally made it on stage at 11:15, (after it took 45 minutes to set up 4 or 5 microphones in an acoustic setting) and it became clear that the wait was well worth it. In contrast to Polly, Laura’s clever, honest and well written songs quenched my thirsty ears - her execution was simply honest and beautiful. She played many non album tracks, perhaps signalling that a new album may be on the way soon, either way, she was utterly captivating, holding the entire audience in awe. She had Marcus Mumford of Mumford and Sons performing with her, and they complimented each other really well. This entry was posted on Tuesday, April 7th, 2009 at 12:43 am	and is filed under Laura Marling, Folk. You can follow any responses to this entry through the RSS 2.0 feed. You can leave a response, or trackback from your own site. flowersintime.org code/design by Mr Strong Arm. blog by WordPress, and board by SMF. All music/lyrics/images © Jeff Buckley, or their respective owners. DB and additional content © Mr Strong Arm.